Today, our friends, David’s parents, are in Washington, D.C. to participate in the memorial to fallen soldiers of the Iraq war called, “Faces of the Fallen.” The photo above is one such face of the war. David said he hadn’t been so tired in a long time having spent a couple of hours playing with Iraqi children. Please pray for the family as we remember the sacrifice of our soldiers. and their loved ones. 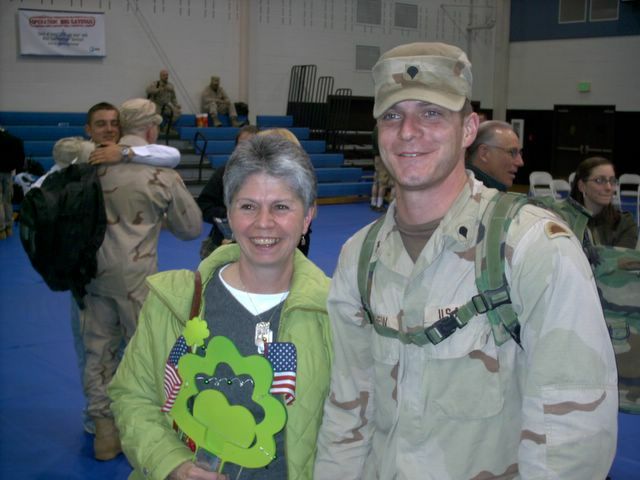 I know, 2004 ended three months ago, but for us the challenges of that year could not be ended until our son, Caleb returned from Iraq. There were three families that stuck together during this trying time. We prayed together, shared our fears and, in one case, wept deeply together when one of our children, David, was killed in action. We rejoice at Caleb’s return, and in anticipation of Jon’s, but weep with David’s family. His parents will be travelling to Washington, DC for the unveiling of the tribute to the fallen soldiers. The driving motivation behind the creation of a Christian subculture in America has been the issue of relevancy. We have wanted to make ourselves relevant to the world around us so that the gospel can be understood in terms that are common to the day. There is nothing wrong with this as long as we can maintain a different standard for how we live our lives. Unfortunately, this has not been the case. We have become so enamored of the primary culture in the process of trying to be relevant to it that we now offer it hardly anything other than another flavor of itself. I used to think American Christians were shallow; now I realize it is American culture that is shallow. Our failure has not been through our identification with the culture as much as it has been through our inability to rise above it. Maybe that’s not the place we should be starting. That we start there may be the reason we can’t find the standard for living our lives differently. What’s relevant to them? Maybe the moving question ought to be, “what.’s relevant to us?” If we look to the world to provide the baseline for our relationship with it, aren’t we apt to be spending more time looking at the world than at God? This is what has been happening. I’m becoming convinced that we need to have a crystal clear understanding of what is relevant to us. How should redeemed, regenerated, sojourners bound for a kingdom that is not of this world live their lives? Let’s start there. Moreover, when I sense someone is trying to be relevant to me, I can’t help but feel patronized. I’m more drawn to a person who is confident in their own space even though I may not be with them in it. Isn’t that the message of many folks today? Stop patronizing me! Stop trying to sell me stuff! Get real; get authentic! What’s up with a world where I can find real lemon juice in my furniture polish but not in my lemonade? —real faith on the streets, but precious little in the churches? Meanwhile, we’re printing bibles that imitate the publications of the world, and producing music that sounds like the world, but isn’t the same. Fischer is right. Another flavor of world isn’t what those who live inside the world need, neither is it what those of us who are outsiders need. What’s needed is a genuine “counterculture.” By that I don’t mean a league of antagonists—storm troopers in the culture war— trying to defend their claim in popular society in order to protect their world-flavored sub-culture. That, it seems to me, is an “anti-culture.” What is needed is a counterculture made up of people who know the eternal Father, and know what He has made of them. For them to live peacefully, confidently imitating Jesus as they honor their Creator, might well appear to the insiders of the world to be a society of faithful people. It might also appear to be a good place to come ashore after running aground in the shallows of American culture. ~Opening to the third season of â€œThe Twilight Zoneâ€ TV program. Iâ€™m starting a class Iâ€™m calling â€œLiving in the Twilight Zone.â€ At first I thought Iâ€™d call it Ministry in the Twilight Zone, but these days I shy away from terms like â€˜ministryâ€™ that have become deeply rooted in the Christian sub-culture. Â· As Christ-followers we are transitioning into a new dimension, a dimension that links time and space with the dimension of the infinite and eternal (some would call it â€˜heaven,â€™ but thatâ€™s another term fairly drenched with the heavy perfume of evangelicalism so Iâ€™ll call it the â€˜dimension of the infinite-eternal.â€™). We are bound for a destination beyond this world. Â· Having been infected with the “good virus” called the Spirit, which is the legacy of a crucified and resurrected Messiah, we find ourselves in â€œthe middle ground between light and shadow,â€ between the limitations of reasoning and the credulity of religion; between the primal fear of living and the limitless hope for something beyond. It is a dimension of imagination, but not of myth and legend. As Spirit â€œcarriersâ€ we are drawn into a reality that strains our imagination: the meta-narrative, the story from which myths and legends descend. It is the First Truth from which half-truths, distortions, and falsehoods flow. The story of our Creator God and His chosen Seed is the meta-narrative. It is our legacy and our story to tell. As Christ-followers, we are not to withdraw from the world, but to carry the light—the story—into the world, living consistently, faithfully and fearlessly as aliens in a place that is only a stopover on a longer journey. Â· We are on a journey of discovery in which we intend to learn who we are in Christ and fearlessly embrace the implications. It seems that there are layers of â€œveneerâ€ that, over time, have been nailed to the frame of the Fatherâ€™s story. It will be our goal to peel away the layers and find what is basic to the life of a Christ-follower. Â· We are not to judge the world as though it should be expected to live as we do in spite of the fact it has not been infected with the Spirit. We are to love the world because that is what our Father did. As Jesus spoke with his Father he said, â€œAs you sent me into the world, I have sent them into the world.â€ (John 17:18). Jesus loved the world. The Father sent Jesus because He loved the world. For that reason, we are to love the world. We are not to sit as judges, rather walk as storytellers, or as revelers carrying a â€œsplendid torchâ€ in the shadows. Â· To do this we will have to practice storytelling and loving—one another and the world. John Alexander, in his book, The Secular Squeeze, put it this way: â€œBut Jesus didnâ€™t stop with stories; he also gave us way to authenticate themâ€¦He told usâ€¦that you tell whether a story is true by the lives of the people who tell it. You judge a story by its tellerâ€¦A good story enables people to lay down their lives for each other and become one.â€ What is called “evangelism,” at its core, is the splendid torch of the Fatherâ€™s story and the story of His seed, which is His Son. This is living in the Twilight Zone. Undoubtedly, Rod Serling, in his portentous prelude to the creepy tales of that third season of the venerable program, never imagined that his words might suggest an approach to living as followers of Jesus. But, as long as light continues to meet darkness there will be shadows. That is where we have to learn to carry a torch. Love: to act for the benefit of another—visibly, practically and intentionally. George, speaking of himself, said that he was a simple man and I believed him. His face was leathered; his features were angular, steadfast and determined, crowned with mussed gray hair. The thing I noticed most were his hands. They were big, hard looking hands, scarred and square, at home with machines and tools. The thumbnail was rough, split sometime by a cruel machine. A simple man, he said. What need do we have of deeper truth when the deepest truth floats on the surface of the scriptures?